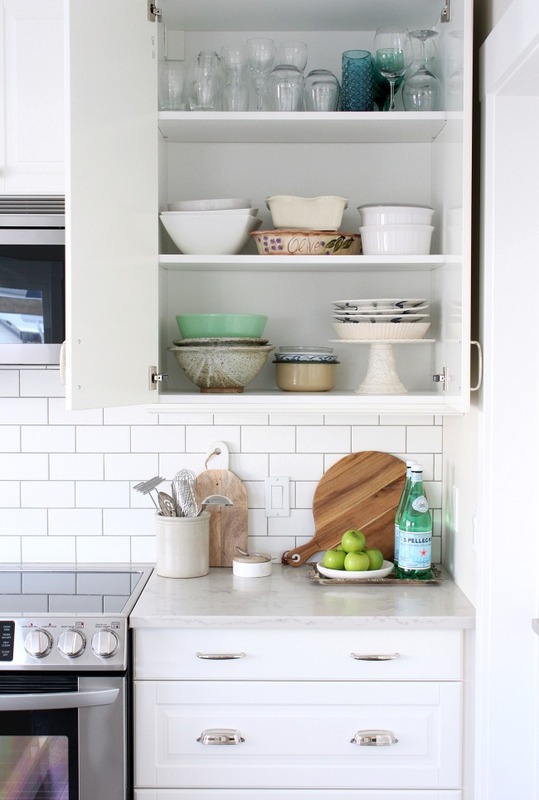 Get these ideas and tips for better organized kitchen cupboards, drawers and more. Simplify your life! Hey there! Can I ask you a question? If I popped by right now and looked in your kitchen drawers and cupboards, would they be organized? How about your pantry? And the fridge? If you suddenly got uncomfortable, this post is for you! I can honestly say our kitchen is organized most of the time. It wasn’t always that way, though. Before our renovation, we definitely lacked storage space and, in particular, drawers. Speaking from years of experience, bottom cupboards without pull-outs are a total pain. I feel for you if that’s what you have! I was constantly bending down trying to reach for something in the dark back corner. There were countless dishes that hadn’t seen the light of day in months (maybe years). Can you relate? To solve this problem, I opted for only drawers and pullouts for all lowers while creating the plan for our new kitchen. It was a greater investment, but totally worth it in the long run. When it came to putting everything back in the kitchen after the makeover was complete, I purged some items, but held on to far more than we needed. I think I was so relieved when the dust and noise and chaos were finally over, that I rushed getting back to a sense of normalcy. In retrospect, I could’ve done a better job. I also lost my patience while lining each and every drawer with protective non-slip plastic mats. IKEA recommends them to quiet the sounds and prevent scratches, and I’ve found they do make a noticeable difference. Usually, I’m one to jump on these kinds of projects quickly. This time, I procrastinated. To my defence, winter around here has been long, cold, snowy and dreary. It’s taken a lot of my energy (if you know what I mean). Although I’ve managed to cross many home projects off our list, I never seemed to get up the gumption to tackle our kitchen organization. I definitely needed some kind of motivation to finally get it done. Call it wishful thinking or the universe answering, or maybe even a total coincidence, but I ended up getting just what I was looking for. Ever happen to you? The Home Decluttering Diet was kindly provided for review purposes. As always, opinions in this post are my own. As well, some affiliate links are included for the book in this post. Check out my blog policies here to find out what that means. 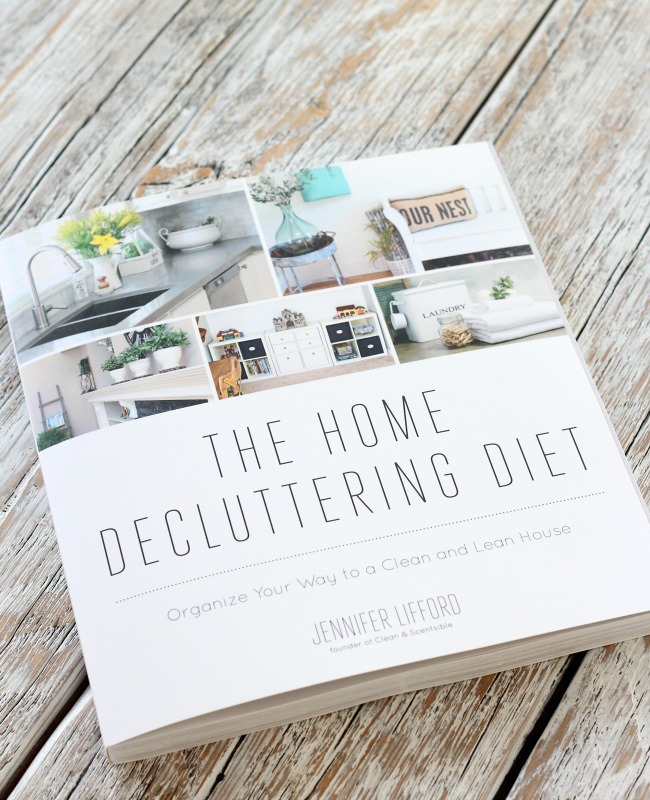 After only flipping through and skimming the chapters, I found myself wanting to better organize our entire home from top to bottom. The kitchen drawer liner I had sitting in my office for months got installed straight-away. Say what? 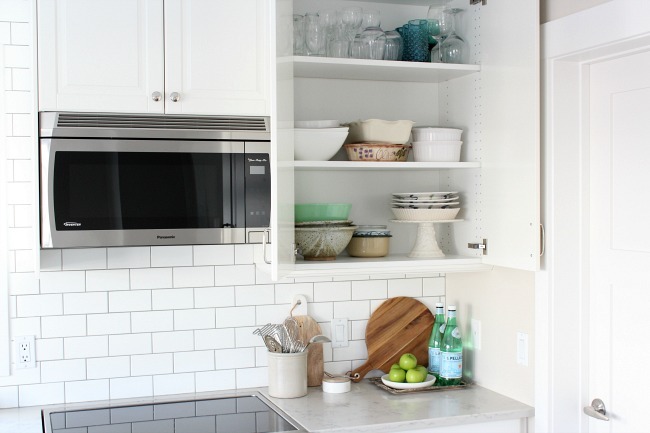 Believe me, the pictures of Jenn’s own organized kitchen will inspire you to tackle your own. She’s an organizing genius! As you can see, having drawers in the island instead of the cabinets that were previously there, allows for much quicker access and view of items. I find it handy and more streamlined to keep all of the plastic lids in a basket instead of with each matching storage container. Oversized drawers for our pots and pans beside the range really help out too. Above that, I did a shallow drawer for cooking and baking utensils. 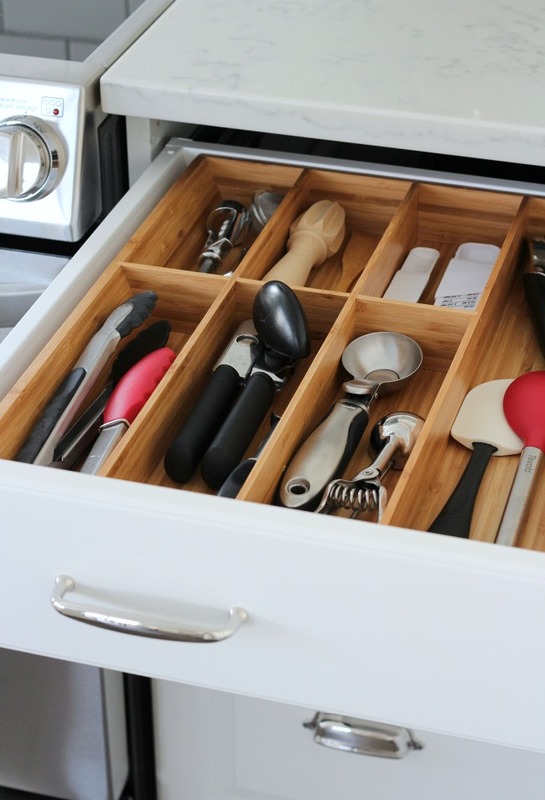 I love the bamboo kitchen drawer organizers from Ikea. Have you seen them? You can find similar ones here. I have a few spoons, whisks and other items that I use on a regular basis in a crock beside the stove for display as well. 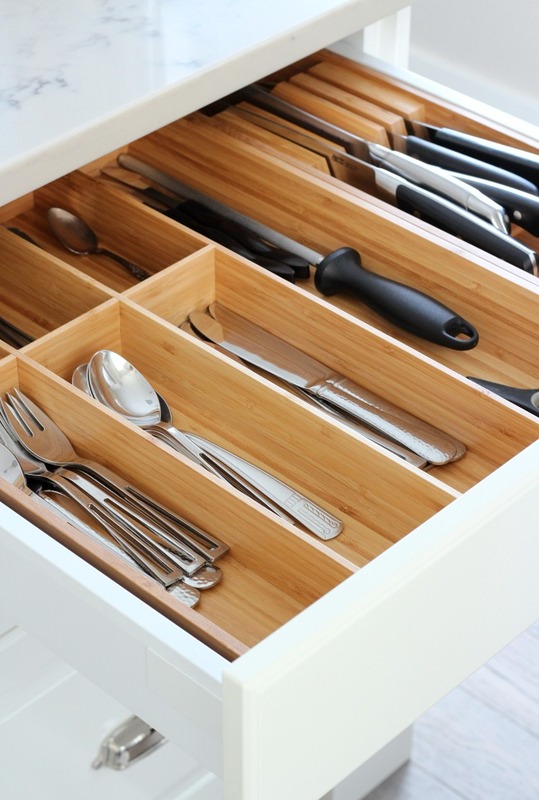 In addition, there’s a bamboo organizer in our island for knives and another for flatware. Having it all directly across from the dishwasher makes emptying it effortless. Using Jenn’s advice, I took a good hard look at our dishes, glasses, utensils and other supplies we hadn’t used in more than a year and put some in a box for our son, and the rest will go to charity. That allowed for breathing space between items resulting in better access. Plus, less stuff makes me feel calmer and happier. Are you the same? Utilizing the full height of our kitchen with tall upper cabinets gave us an extra shelf for storing items we use less often like our crystal wine glasses. Before, it was wasted space that simply collected dust. 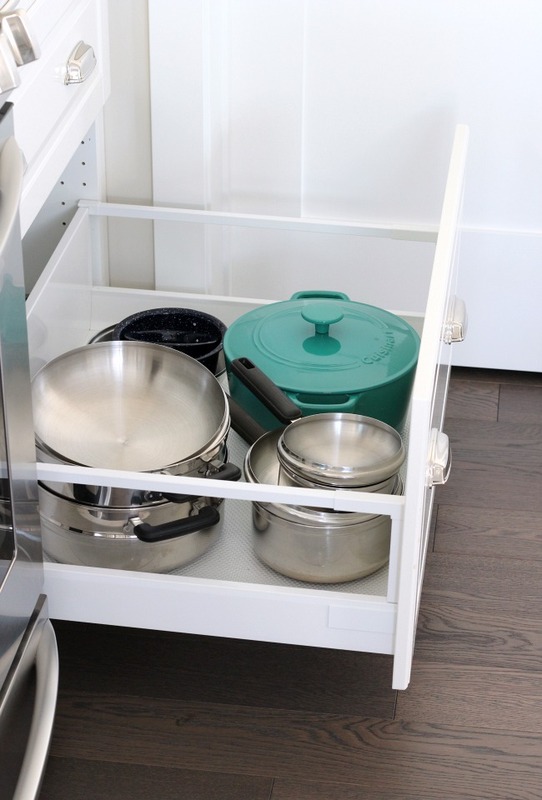 Although we did switch to a refrigerator with a bottom pull-out just before the renovation, I kept the same clear storage containers I put together before. Having everything labelled in the kitchen helps a bunch, especially when it comes to the pantry. That’s better! I can breathe better now with an organized kitchen! 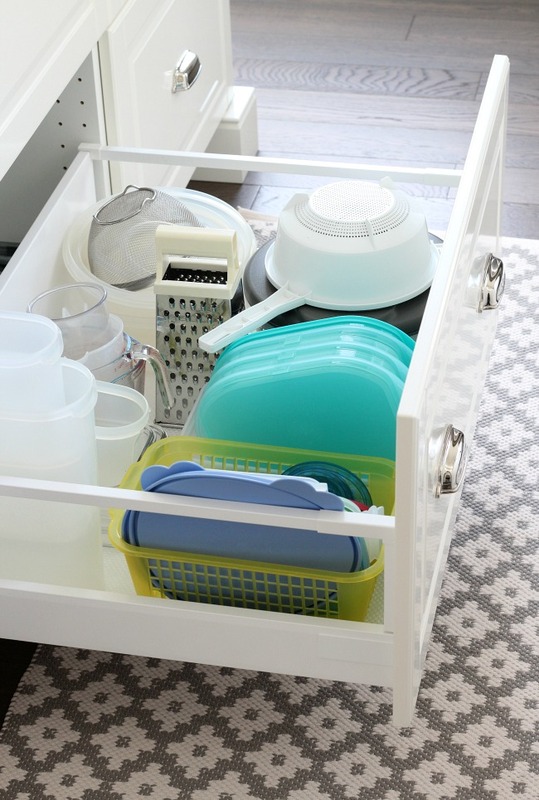 Don’t worry if you’re clueless when it comes to decluttering and organizing. 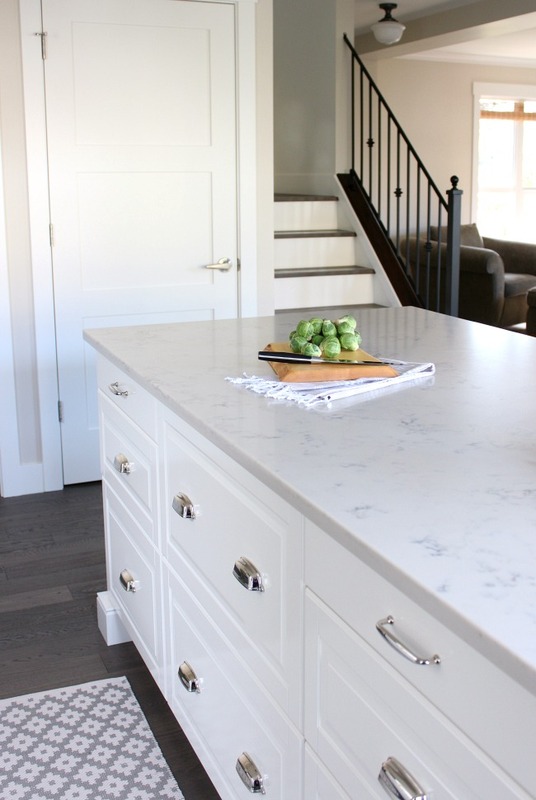 Jenn walks you through the whole process step-by-step for any space in your home, whether it’s the garage, bathroom, entryway, kids’ rooms or somewhere else that could use your attention. As a result, you’re in good hands. For me, the bane of my existence is my office, so I’ll be taking some of her tips to heart while tackling it later this month. 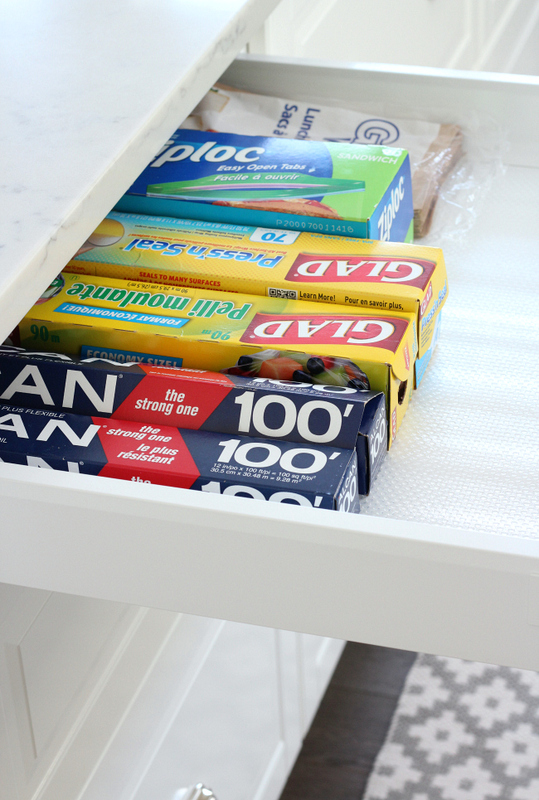 Just take a look at those drawer organizers! Getting Your Hands on this Awesome Book! Need this kind of motivation and guidance? I encourage you to order the book through Amazon (CA or US), Barnes and Noble or Indigo. If you prefer an e-book version, it’s available on Books-A-Million. It’s definitely a step in the right direction when it comes to creating a clean and lean house. 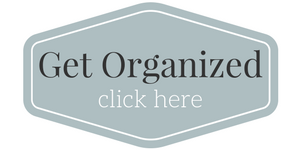 What’s your biggest organizing issue? Do you have too much stuff? Is your space too small? Something else? I’d love to know! 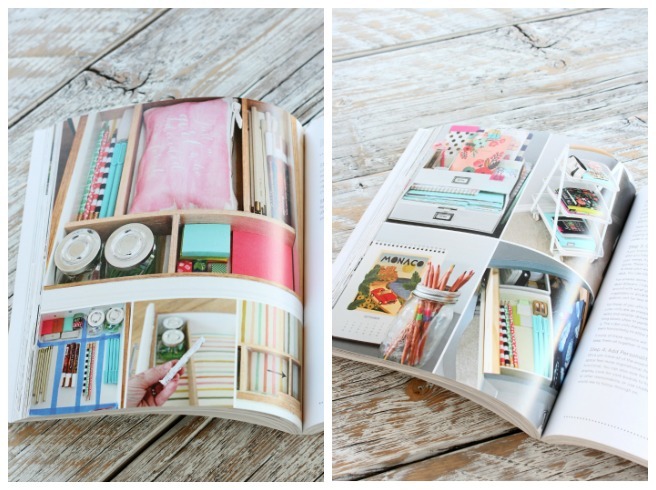 Lastly, are you looking for more organizing ideas? Go HERE. You have a lovely kitchen. Thank you for the tip about the Ikea shelf liners. I was looking for a solution, and just don’t like the idea of the peel and stick liners. I also love the knife storage! Great post. Gorgeous kitchen, and super-organised to perfection! I love how well you have organised your entire kitchen, it really looks amazing. Love the post. Are you still pleased with the TCE quartz? We too are thinking it would be nice to pay less if the quartz is nice. I like yours very much. Yes, we’re very happy with it. I was told by our supplier (who also carries Caesarstone and Cambia) that there’s very little difference from brand to brand. TCE was a better priced option when we did our kitchen 3 years ago. Hi, love your kitchen. What Color of TCE quartz is that? It’s the perfect blend of grey veining.